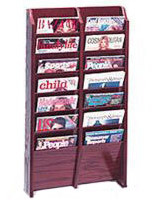 Each of these mahogany literature stands for commercial use has seven pockets in which to display and dispense periodicals that are letter sized. 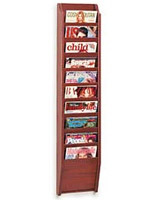 These wood mounted systems sit vertically, and titles are visible due to the thoughtful design. 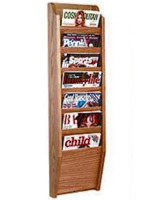 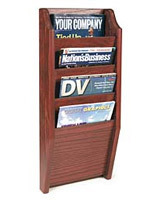 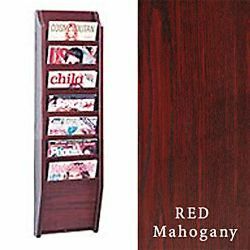 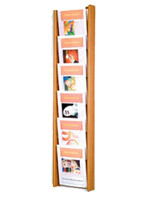 These mahogany literature stands, also known as pamphlet organizers, is perfect for a doctor's or lawyer's office, hotel lobby, or retail shop. 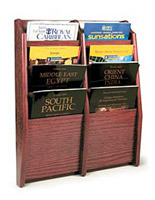 Order in bulk for huge savings! 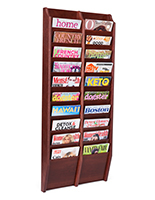 These mahogany literature stands that are magazine holders fasten on the wall, leaving the floor and counters open for other business fixtures. 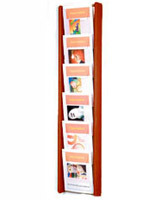 10.5" x 24.0" x 4.8"